We are here to serve those who serve. We want to be the first choice for these brave men and women, not a last resort. Incidence of traumatic stress, substance abuse, depression, panic attacks, and anxiety are at an all-time high among the men and women who serve. Far too many are unemployed and homeless. Suicides are rising at an alarming rate. Our military and first responders face critical, stressful events every day, with few avenues to help them when times get tough. Unbridled Connection exists to support the members of our military, both active duty and veterans, and first responders. We offer multi-modal, trauma-informed services in a private ranch setting. Our program utilizes proven methods, tailored to meet the needs of each individual, and is as unique as the men and women we serve. Horses and nature are at the center of our program, because we believe they provide a solid and peaceful environment for true healing. Our therapy teams are experienced, well-trained and passionate. They understand the unique needs of the men and women in uniform. We provide individualized experiences that will transform lives, focusing on relationships and long-term healing. Our program helps clients deal with trauma and gives them the tools they need to continue serving. We do not take this responsibility lightly, and we honor the privacy and confidentiality of each individual, taking extreme measures to protect identities and keep everyone safe. We are here to offer assistance to those on the front lines, serving our communities and our country. Our goal is to save lives and save families. 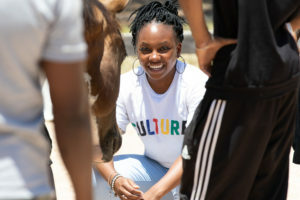 We are a 501(c)3, focused on legacy work and serving our community, so our passion for people motivates us to offer every opportunity possible for people to experience connection with our horses and our team. We offer horse therapy, equine assisted learning, equine experiences, coaching, workshops, group retreats and team building and leadership development training. Kelly Jones, owner and founder of Ponderosita Ranch, home of South Wind Equestrian Center and Executive Director of Unbridled Connection, found this beautiful oasis tucked in the Texas Hill Country in 1999. Kelly experienced her first horse as a 2- year old on her great grandfather’s farm outside Fort Worth and as soon as she could, began working at a stable, earning riding lessons. 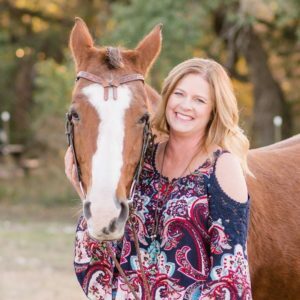 After graduating from Texas Tech University with a degree in Marketing, and enjoying the corporate life for several years, Kelly moved to the Austin area and discovered Ponderosita Ranch. Today Kelly specializes in relationship work with horses and humans, focusing on bringing attunement both to self and to others through allowing the horses to teach and guide us through re-connecting with personal power and instinct. She is certified in Natural Lifemanship and serves on multiple therapy teams, as well as coaching one on one. Kelly’s heart is helping families and serving those who served.